VOSS Fluid, leading international supplier of fluids technology, presents its product range for efficient solutions in the construction equipment industry at Bauma China. One highlight at the trade fair is the VOSSFormSQR System that particularly meets the maximum requirements. The forming system forms a contour in record time on a commercially available hydraulic tube and, thus, ensures a high quality connection. Users profit from increased process reliability and leak protection and in this way increase their competitive edge. In addition the Type 90 Comfort preassembly device for series production assembly of cutting rings and the special VOSS coat corrosion protection take centre stage at the leading Asian trade fair for construction equipment. Interested specialist visitors can find VOSS Fluid in Hall N4, Booth N4.261. The VOSSFormSQR tube coupling system, in combination with the VOSSForm 100 forming machine, sets new benchmarks for the safety, quality and efficiency of hydraulic connections. Through its easy to install design the system impresses with permanent freedom from leaks. During forming a 24o tube contour is formed on the end of a hydraulic tube. This is supplemented by a soft seal and the special SQR-function nuts. The result is that VOSSFormSQR offers an additional protection from leaks. The machine is operated by simply inserting the end of the tube against the stop plate. When using this operating concept installation errors are almost completely prevented. Protection against corrosion is paramount for the long service life and efficiency of hydraulic connections. 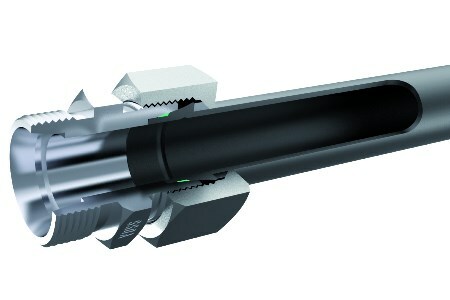 VOSS Fluid uses the VOSS coat surface for all tube connections. VOSS Fluid also introduces the high quality zinc-nickel coating made from in-house galvanising at the trade fair. The surface ensures a significantly higher resistance against red and white rust. VOSS coat is especially wear resistant against mechanical loads. The latest technology from VOSS Fluid also offers the Type 90 Comfort preassembly device for efficient prevention of errors in the automated installation process of cutting rings. The Type 90 Comfort preassembly device automatically detects tools, independently adjusts operating parameters and identifies operating errors due to incorrectly inserted cutting rings. This reduces the risk of an improper assembly to a minimum. Fair visitors can receive more information from 22 – 25 November 2016 at Bauma China in Hall N4, Booth N4.261.